I spent the weekend at TotalCon in Mansfield, MA. I visited with old friends, drank too much and absolved myself of real grown up responsibilities for a few days, but mostly I ran 5th Edition Dungeons and Dragons. I DMed six session slots for a total of 25 hours of play (that last one on Sunday went an hour long). These were not six sessions of the same couple of adventures run over and over, but rather one continuous hex-crawl exploration, a sort of table-top massive multi-player game called “The Valley of Tombs” that actually started at CarnageCon in Killington VT this past fall (that’s a total of 11 Con sessions I have run it, by the way). It was exhausting. It was fun. It was overwhelming. It was glorious. And, it taught me some things. 1: The most time consuming thing is getting everyone up to speed. With only one exception, every session had at least a couple players that were unfamiliar with 5E and who had not played the Valley of Tombs before (either at Carnage or at a previous TotalCon session). While this was no surprise, I was taken aback at just how much time it can take to get a player comfortable enough with both the system and the conceit of the game to be able to choose a character, parse its abilities and role in the party and be ready to strike out in search of adventure. And while I think I got “the spiel” down to a reasonable length by the end there, my introduction to both 5E and the Valley could certainly use some tweaking. 2: Valley Veterans are a Godsend. There were two sessions in which folks who had not previously played were entirely absent and their absence was felt. It was not simply an issue of history and lore, though having folks around that appreciated and could impart that stuff was nice, but one of logistics: veteran players were able to bring new players up to speed while I was organizing my notes and preparing for actual play. Thankfully, I had a ton of veterans by Con’s end and I appreciate everyone who sat twice or more at the table. 3: Characters should belong to players. There is something neat about picking up a PC that has some treasure, some XP and some history, but one thing I did not think about was just how profound player versus character knowledge became with a mix of veteran and new players. Some characters were chosen consistently throughout even though players came and went, which meant Gar the Half-Orc Ranger experienced the first brush with the Faerie-Eating Spider-Men, Bob could not explain that information to Jane since Fred had actually played Gar the previous session. The shared journal I have players fill out helps some, of course, but unless Gar’s player was running the journal, Gar’s perspective is lacking. I think one-and-done PCs for any player are necessary given the format, and since levelling is slow slow it should not impact the balance of the game. 4: No one cares about the Inspiration die. In the Con game format, I wanted to avoid everyone jostling for role-playing time with their Flaws and Ideals and such to gain Inspiration. Instead, I had one Inspiration Die that was meant to move around the table. If you got it (for being awesome, for making the game fun, or for bringing me beer or coffee) you could use it anytime you wanted, but then it went back into contention and the next awesome, beer-getting player got it. In reality, no one remembered it was out there. Maybe I give advantage too often or maybe the die being in one player’s possession makes everyone forget about it, but there were very few situations in which it got used at all. I will have to rethink the Inspiration Die bit. 5: Tea is my larynx’s best friend. I had a cold last week anyway, and spending all that time talking certainly strained my voice. Throw in the late night parties and I should have been voiceless by Saturday. But I took that advice of my beautiful and hyper intelligent wife and brought an electric tea kettle to the Con and was able, with judicious use of honey and lemon, keep myself able to be heard. As an added bonus, the kettle was also great for instant oatmeal and Ramen as a way to save money on meals! 7: If you are going to wing it, be prepared. That sounds contradictory, but it really proved its truth this weekend. In the weeks leading up to the Con, I had some trouble dedicating the necessary amount of time to be ready for this. So, it turned out that because I do not run any early morning games (you’ll remember the thing about the late night parties above) I had a few hours every day to tweak previously prepared stuff and add new material, without knowing whether it would get used. Open world sandbox gaming requires lots of material on hand, whether it is cribbed from other sources, based on random tables or created whole cloth. Otherwise, the game slows to a painful crawl. I made good use of my mildly hungover, tea-drinking time and it paid off. 8: Random results are best results. There is no better way to illustrate this than by example. During the aforementioned preparation, I rolled a treasure hoard that included, of all things, a bag of beans. I have never used a bag of beans in a D&D game before and would likely never have thrown one into the treasure mix on purpose. It happens to end up in a hoard that the PCs acquire (though they don’t know what to make of it — either PCs or players). Later, those same PCs end up in a dire situation: a few party members are trapped in a sealed room, running out of oxygen, dying the slow, ignominious death of the tomb raider while their friends tried desperately yet futilely to free them. Finally, with nothing left to lose, they decide to drill a hole in the many-ton stone block that traps their companions, stuff said hole with dirt and plant a bean from the bag. One percentile roll later, a massive pyramid erupts from the bean, destroying that portion of the dungeon and providing a way out for the doomed PCs. And, on top of it, a terrible mummy lord lives in said pyramid, thereby adding a new wrinkle to the setting. None of that awesomeness would have happened without a few random rolls. Yup. Just about like that. 9: Allosaurus riding lizardmen make everything okay. My last session of The Valley of Tombs for the weekend was the Sunday 1 PM slot. Thirteen players ended up at that table (because I can’t say “No”) and I was sure it was going to crash and burn. My TotalCon legacy was going to be a baker’s dozen of disappointed players. At first, it seemed to be going that way with minor details turning into major plot points and some intra-party machinations threatening to derail things. Then, at just the right moment (i.e. with less than an hour left) the party heads to their original adventure site which turns out to be full of lizard men riding Allosauruses (Allosauri?). It made everything better. 10: The Valley of Tombs is an actual thing. When seven of nine (insert Star Trek borg bosom joke here) 1 PM slot players chose to forego their pre-registered 7 PM games to continue their adventures, I not only realized I had something pretty cool on my hands, I was more flattered than if I had won IronGM (which I decided not to do this year since I wanted to run Valley). It isn’t perfect yet and there is a lot of work to get The Valley of Tombs into a semi-pro state, but I think it has legs. My goal over the next few months is to build it a website and develope it well enough that it becomes an honest to goodness actual “thing” at New England regional gaming cons, probably starting with OGC Con in New Hampshire in June. I loved running this event over the weekend and I really do think it has potential to be a fixture for years to come. I want to thank every player that sat at the table, but most especially those that kept coming back. You guys rock. Here is a description of the town and people of Threshold, gateway to the Valley of Tombs. Players of the old BECMI D&D set will remember the name and the homage is intentional. The town of Threshold is the gateway to the Valley of Tombs, where would-be adventures, tomb raiders and prospectors come to test their fortunes and fates against the threats of the Valley. It was established only a decade ago in cooperation between the Finder’s Guild and the Gunt minor noble house. And while it is not the only settlement in the Valley (see also Minehold and Lakehold) is is the most important. The leader of Threshold is Lady Eldra Gunt. While ostensibly an elected mayor of the town, she has never been opposed in an election and in any case only land owners in Threshold, of which there are very few among the many itinerants and wanderers, are allowed to vote. Lady Gunt makes certain they are all well pleased with her policies or they do not remain long in Threshold. Lady Gunt’s chief supporter is Sheriff Balthazar Grimes, a former highwayman and sell sword elevated to public office based on his readiness to do whatever Lady Gunt orders of him. As sheriff his official duty is to protect the people of Threshold. In reality, he serves as both a tax collector and shakedown artist for Lady Gunt. Anyone entering Threshold must pay a 10% tax on all wealth found in the Valley and Grimes is well known to demand other taxes, tithes and fines of newcomers. He is a dangerous man, skilled and gleefully cruel in combat, and he has the good sense to make life comfortable for the guardsmen under his command who tow the line. The only other town “official” is the sage of the Finder’s Guild, an aged elf named Eraneon. He technically has a full voice in town affairs based on the agreement between the Guild and House Gunt that established Threshold, but in reality he cares very little for the goings on of the mayor and her toadie. As an elf who has lived a very long time, Sage Eraneon views any political situation in Threshold as ultimately temporary and is far more interested in exploring the Valley and delving its secrets and treasures for the Guild. Elves know only knowledge lasts forever — everything else is transient. That said, Eraneon has been known to aid successful Guild contractors in avoiding trouble with Lady Gunt or Sheriff Grimes as long as those contractors are discrete and did not bring the trouble down on themselves. There are a few scattered taphouses in Threshold but only one inn of any note: The Keg and Kastle, operated by an ex-tomb raider named Holger. His prices are reasonable, his food is edible and his rooms are clean and secure. He bears no love for either Lady Gunt or Sheriff Grimes but knows better than to cross either of them, especially for adventurers who are as likely to die in some ancient barrow as they are to ever return a favor. Rumors persist of some great wealth or hidden treasure in the cellar of the inn, but no one has ever confirmed it and all Holger ever says about it is that when he retired he spent all his treasure securing the K&K. There are no limit to the number of peddlers and self-styled merchants in threshold trying to part folks from their tomb-findings with shoddy wares but there is only one recognized shop in town. Operated by the grotesquely obese dwarf Garil (the shop is called simply “Garil’s Goods”) it serves as a trading post for all manner of mundane items. Garil’s prices are outrageous — he charges half again the usual rate for everything — but he is honest insofar as he will not sell low quality merchandise or cheat his customers. He is firmly in alliance with both Lady Gunt and Sherrif Grimes and has been known to turn in people who have tried to avoid their taxes by selling goods to him. It is suspected that he gets a portion of those “found” taxes. Threshold sits on the bank of the river and riverboats move goods and people between Lakehold and Threshold and then on to Guntville (seat of House Gunt) one hundred miles downriver. The Threshold dockmaster is a female halfling named Middie Bow. She is a friend of Holger’s and hates both Gunt and Grimes but is in no position to oppose either since her job is assigned and she could easily be replaced. Monster Manual page 285:Succubus/Incubus! That is a promising start. Player’s Handbook page 134: the Hermit character background! and finally Dungeon Master’s Guide page 117: underwater visibility, “The Sea” and “Navigation” and a beautiful painting of an adventuress opening a treasure chest at the bottom of a shallow sea or lagoon. The above collection is a pretty good example of why I believe that random elements in both gaming and storytelling are of worth. It is not that any individual aspect of an idea must be unique or revolutionary, but rather that with the right combination of even common tropes and images (and what of the above elements is not an old fantasy trope?) you are empowered to create something new. By absolving yourself of the responsibility of coming up with a “great idea” and letting Fate decide, you are freed from your own limitations and biases in at least the most foundational aspect of creation: brainstorming. For my part, I can imagine having come up with come idea built around a succubus, a hermit or underwater treasure hunting, but not likely one combining the two and certainly not all three. The first thing to do when trying to weave these disparate results into a cohesive idea is to put them into a larger context. In this example, I have two specific things that contextualize the idea: 1) this is a Magical Monday entry, which pushes the idea in the direction of something wondrous rather than monstrous, and 2) it must be useful for my Valley of Tombs adventure setting — with TotalCon coming up fast, I can’t afford to waste any creative time and energy on anything else. With those two requirements in mind, I can start to figure out what to do with these three random elements. Since this is not a Wicked Wednesday entry, I am not looking to create a villain or monster to plague explorers of the Valley of Tombs. That throws out the idea of a villain succubus or incubus, which is well enough since it is a tired idea anyway. Instead, reading the Hermit entry and thinking on the charm aspect of the succubus and incubus, I decide the following: the Hermit was once a wealthy money changer who lived in the town of Lakehold. We will call him Zetherith Ennar (random name generators abound on the internet — find one that works for you!) and say he is a half elf. He was charmed by a fiend, however, that used his wealth and influence to cause pain and heartache among Zetherith’ family and clientele. Just to buck the usual “evil woman” trope, I’ll say Zetherith was charmed by an incubus, whom we’ll call Adoth Firefair. Eventually, the fiend tired of his game with Zetherith and decided to drain the life from the moneychanger but before he could murder his mortal pawn, Adoth was attacked and driven back to the Hells by Church Inquisitors (I am keeping this bit intentionally vague: I like having players be able to define their character’s religions and organizations, which means leaving much of the larger world in which the Valley of Tombs fits into undefined). Because Zetherith was never able to shake the magical charm Adoth had placed on him, even after the incubus was driven to his home plane, Serveris Ennar harbored an abiding and tragic love for the fiend. Moreover, Zetherith was exposed and blamed for the damage caused under Adoth’s influence and driven from Lakehold, becoming a hermit living in an ancient abandoned lakeside light house a few miles from town. While under the power of Adoth Firefair, Zetherith Ennar continued his money changing and money lending business. Using wit and guile, he tricked many of his customers into bad (but perfectly legal) investments and gambles and invariably those people lost their wealth. Adoth Firefair knew that those who lost everything were capable of the most desperate acts and enjoyed watching chaos spread through families and the community. Each gold piece Zetherith collected this way was cursed by Adoth’s taint and the incubus convinced Zetherith to collect it all into one treasure chest. When the inquisitors came for Adoth and the townsfolk turned against him, Zetherith cast the chest into the bay of Lakehold for fear that the evil of Adoth would follow that money forever and bring misery to whoever held even one silver piece of it. While no one saw where Zetherith drowned the chest, rumors persists still ten years later of its existence. Player characters coming to Lakehold may hear rumors of Zetherith’s Gold and might be able to hunt down the hermit and find out the truth of the story (Zetherith will only willingly give up the location of the gold if the PCs indicate they can cleanse it of its curse and promise to give it to the Church that drove Adoth away). The chest contains 531 gp, 2398 sp and a small collection of gems (12 worth 1d6x10 gp each). Adoth’s curse is real, however, and anyone keeping the money for themselves or spending it on selfish desires is cursed to suffer Disadvantage on any and all saving throws made against the effects of magical charms. In addition, this curse is obvious to any evil outsider that possesses a charm ability. The only way to remove the curse is to atone by giving away 3 times as much wealth as they kept or spent for themselves. For Wicked Wednesday this week, I will roll randomly again and see what pops up! This week I present an established villain in the Valley of Tombs “Massive Multiplayer Table Top RPG” convention game I run — coming soon to TotalCon! — which is illustrative, I think, of the kinds of bad guys I find interesting in RPGs. The stats are for 5th Edition Dungeons & Dragons, but I think Lord Black can be easily converted to any version of D&D or related game. Not all souls that haunt the Valley of Tombs were interred there. Long before the Valley was cut off from the wider world, some chose to rule there in life rather than rest there in death. Perhaps it was the promise of treasures both rich and powerful from ages past. Perhaps it was a kinship with the Other World that rests so close to This World in the Valley. Or perhaps it was simply the fact that few dared claim the Valley, making it appear at least as an easy mark for a would-be dominion lord. The man that is now known as Lord Black was one such would-be ruler. The lesser son of a lesser house whose inheritance has been squandered by his elder brothers, he took what feeble bodyguard he could muster and led them to the Valley, which was even then so many centuries ago famed for its terrors and treasures. “If I die in my quest to be a king,” he said, “then at least I can be buried as one.” His last act as scion of his house was to slit the throats of each of his siblings as they slept. The Valley is an unforgiving place even in the height of summer. In the depths of winter it is as brutal and cold as the frost trolls that come down from the mountains to hunt. The self styled Lord of the Valley lost half of his retinue in the first winter, and would have lost all had they not turned to the Wedigo’s Feast for sustenance. The hardest and cruelest survived, however, and with the spring thaw they sought their vengeance on the Valley and the few good people that inhabited its outskirts. They robbed graves and raided tombs, demanded tribute and captured slaves. By the waning of summer, the Lord Black To Be had erected a motte and bailey and called it a palace. This winter, he would not starve, even if he had to eat all his slaves. Who knows what twisted pleasure Madra Nocht gained from her bargain with him, who she now dubbed Lord Black. No mortal can fathom the madness of her race, ancient and vile as it is. No matter her reasons, she told the newly minted Lord Black where there were tribes to conquer and where he could find the tools to do so. She gave him keys to the richest tombs of kings long dead that she had also crowned. Over the course of years, Lord black plundered and conquered, destroyed and constructed. He slew giants and dragons and warred with centaurs and goblins. He raised towers and razed churches. Never did he take a wife, or even avail himself of any slave-girl, for he ever feared what might happen should he produce an heir. Not to the heir, mind you, for Lord Black cared nothing of any other, even a theoretical son and heir. No, he saw treachery in madra Nocht’s gifts and feared the completion of the contract would end his prosperity. And so it would have remained had it not been for the Pilgrim Maid. Her name is long lost to history. Only Lord Black and Madra Nocht know it now, and neither will speak it — he because it pains him too much, and her likely because she does not care to remember such trifles. She came with a flock of pilgrims to visit the resting place of their living god. Lord Black’s knights took them as slaves and when they brought the most beautiful of them to him as his share — as they always did, and he always sent her to the dungeons — he was enchanted and sent her to his kitchen instead. In time, she went from his kitchen to his hall and eventually to his side and finally, married, to his bed. Had Madra Nocht, tied of the wait, cast a spell on him or given the Pilgrim Maid a love potion? Who knows the truth besides Madra Nocht? The result was the same and within a year of the wedding the now Pilgrim Lady gave birth to a son. The child was not yet swaddled when Madra Nocht appeared to collect her due. Lord Black resisted her with the power he had gained but to no avail. Her might was greater. As Madra Nocht took the child, the Pilgrim Lady cursed him for his lies and treachery and, finding the chirurgeon’s blade attacked him. He stabbed her through the heart with his ancient sword in his rage. Madra Nocht left with the child and Lord Black told all that both mother and babe had died in childbirth. Wracked with guilt, Lord Black raised a cathedral to his wife’s god and prayed for forgiveness. No answer came. On the babe’s would-be first birthday, Madra Nocht delivered to Lord Black the child’s bones, scraped as they were by her butcher’s knife. He fell into madness then, becoming a terror to his own people. Over many years, he drove them away, murdered them and tortured them. Only the hardest and most evil men stayed in his employ, making him even harder and more evil himself. Finally, devoid of all holdings bust the cathedral and all followers but murderous cannibals, Lord Black died of wrath and grief in his befouled cathedral. His men dined on his flesh and then fell on their swords. Such was the end of Lord Black’s rule. Or, it would have been if not for Madra Nocht. The night hag came to Lord Black’s tombs and breathed foul unlife into his butchered corpse. When he rose, he knew that he would forever haunt the Valley he had sought to rule and with an unhallowed gesture woke his servants, their dead bellies still full of his flesh. Ever since, Lord Black the wight and his army of ghouls and ghasts have haunted the Valley of Tombs and sought to spread fear, death and grief to any who dare venture or settle there. He especially targets good clerics and other servants of light. All Attacks +6 to hit with a damage modifier of +4 instead of +2. Lord Black wears a suit of Plate Armor of Resistance to Radiant Damage and a Ring of Invisibility, and his sword is a Sword of Life Stealing. In addition, mortal creatures killed by Lord Black rise as ghouls rather than zombies. 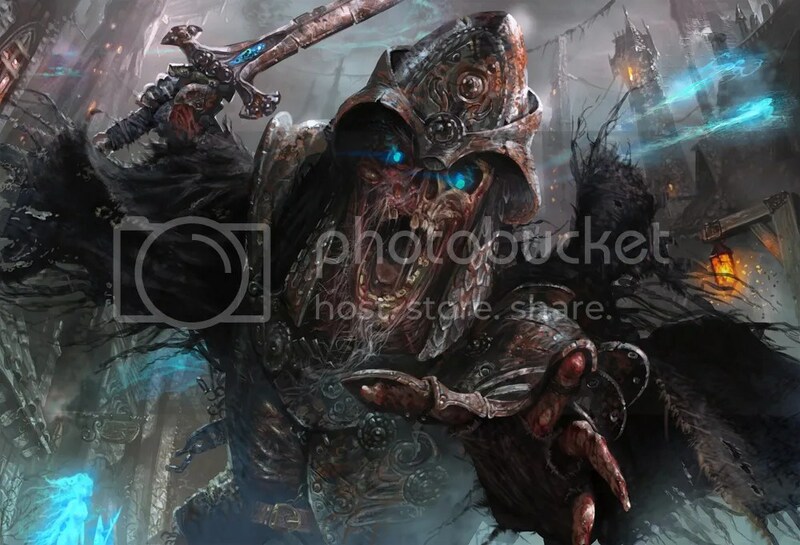 Lord Black is always accompanied by at least 4 ghouls and 1 ghast, and possibly more if he is expecting a large group or otherwise dangerous opponent(s). Despite his hatred of living things and irredeemably corrupt nature, Lord Black can be reasoned with and may even ally with characters that can promise to destroy Madra Nocht permanently (a difficult task indeed). Her true destruction would destroy Lord Black as well, freeing his tormented soul.